Apple’s U.S. lawsuit against Google/Motorola in the state of Wisconsin has gone down in flames, as U.S. District Court Judge Barbara Crabb dismissed the entire case with prejudice before the trial could formally get underway. As in another case dismissed with prejudice earlier this year, and Apple’s lost rights to the iPhone name in Mexico last week, the details of what happened make it hard to avoid feeling that Apple’s own hubris (or at least that of their lawyers) may have cost them dearly. The trial in question involved FRAND patents; specifically Apple was claiming that Motorola was abusing them and that Motorola should be forced to offer Apple a license to those standards essential patents (and possibly pay Apple punitive damages). The trouble started last week, when Apple submitted a motion indicating that while they wanted the court to force Motorola to make a court-determined licensing offer, Apple was not willing to agree to take that offer if the court found that the fair price was more than $1 per phone. In other words, Apple wanted the court to force Motorola to offer a “fair deal”, but to leave Apple with the right to reject the deal if Apple didn’t think it was fair. Judge Crabb, who had previously seemed quite intent on getting this situation solved, was suddenly left with the possibility that the entire trial could finish with Apple simple walking away from the verdict if they didn't like it. As a result she accused Apple of using the trial as a global bargaining chip rather than a way to solve the problem – a claim that is hard to refute given the lopsided treatment that Apple was demanding. She asked for clarification from both sides, and with Apple still being wishy-washy on whether it would be bound to any court-determined agreement, she dismissed the case with prejudice this morning. The result is that Apple not only failed to get the ruling it wanted, it cannot file the same case against Google in any other court (although it can appeal the ruling to a higher court, which it undoubtedly will). In contrast, Microsoft is also suing Motorola on FRAND abuse charges but has agreed to be bound to whatever licensing agreement the court deems to be fair. And as a result that trial is going ahead as scheduled. Given these two different attitudes it’s hard not to come away feeling like Microsoft really wants to have the issue settled, while Apple simply wants to only expose itself to “heads I win, tails you lose” types of situations. Even in the Apple v. Samsung case the judge frequently admonished Apple’s lawyers for their overbearing requests, and of course they were censured recently by a UK judge for their pseudo-apology they posted that directly contravened a judicial order. We aren’t lawyers, but it seems like the cumulative impact of these rulings is reinforcing an undesirable stereotype about Apple that could eventually hurt its brand. And at the least it seems to have cost them at least two trials in the U.S. alone. Tell us what you think about Apple’s legal strategy in the comments below. You reap what you sow, I guess. Haha, Apple must think b-c they can charge $30 for a connector they are the supreme authority in the world. Judge Koh was right they are all smoking crack in Cupertino. And guess what? after all that, there a 5 Apple fans on PA which still supports them, how so low can they go, turns out there brainwashed iZ0mb!€$! The five of them are smoking cracks too! "What you gonna do? What you gonna do? When they come for you... Bad boys, bad boys." I think i'll start writing a funeral song for Apple. Will the realiz00mb!3$ please stand up, please stand up. Sound like Ns-yoonji - The reason apple becomes iwitch? "impact of these rulings is reinforcing an undesirable stereotype about Apple that could eventually hurt its brand" .... could already happen??? WTF? Fact - This has been happening ever since the Apple v Samsung rubbish started. @cheetah: before, really. Pretty much the apple vs Nokia battle that apple lost seemed a point where they started trying to bully through legal means rather than financial ones. Cisco seemed to be the start of the snowball. Google I am your Father. 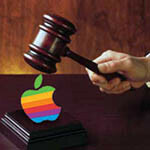 Hmm how to describe Apple's legal strategy... Desperate? Pathetic? Greedy? Really bad news for Mxyzptlk Wendygarret serious9010 Quakan Darkjedi and Gallitoking. The only reason you win in your own statrs due to bribery, i assume and believe. Pride respect honuriszm . unlike shame, o wait what shame Apple dont have no selfrespect, rotten cowards. Hahahaha everyone the world will be laughing. wow.. not even going to answer that.. lost all respect for you..
Oh no, he lost the respect of a certified idiot who cannot even form a complete sentence, whatever will he do? Wow. Gallito, you act like a jerk toward most everyone on here, and now you're reporting someone who calls you out on it? That's f**king low class, man. He doesn't troll as much anymore and comments from Android fans on here have gotten even more ridiculous than the comments of Apple fans lately. I think we should all stop this crock of BS and enjoy the new technology which we all evidently have a mutual passion for. Jesus, people. is that you Non-Sequitr...? Wonder what happened to you? Your posts and comments were different 2 months ago, you were supporting Droid, now you've become more like Chaoticrazor, wonder why? i assume due to PA banneds....? You generally don't get warnings or moderated unless idiots report you. Your post indicated you were going to report him.